The 12th green at Gearhart Golf Links. It’s not always the case, but when billionaire golfers decide to throw a tiny fraction of their wealth into construction or purchase of a golf course the results are usually pretty good. Jerry Rich (Rich Harvest Farms), Warren Stephens (Alotian Club), Charles Schwab (Nanea) and Al Stanger (RIP, Wolf Point) are just a few of the mega-wealthy that have put their money to good use, and a certain Presidential candidate has also built or bought his share of quality tracks. The king of the course-makers though is surely Mike Keiser whose, vision, courage, love of the game, and financial resources have given the world a number of courses ranked among the planet’s best – Pacific Dunes, Barnbougle Dunes, Cabot Cliffs, Sand Valley, etc. Sixteen years ago, Tim Boyle joined the party. The CEO of Portland, OR-based Columbia Sportswear, who’s currently worth $1.66billion according to Forbes, teamed up with Bill McCormick of McCormick and Schick and a handful of other local property owners to purchase Gearhart Golf Links on the Northwest Oregon coast, 80 miles west of Portland and a 240-mile drive up the Pacific Coast Scenic Byway from Bandon Dunes. Gearhart’s history is a little fuzzy. There seems to be three of four clubs, maybe as many as half a dozen, that claim to be the oldest in North America west of the Mississippi. Some may be grasping rather, but in a sense they might all be right – this course has the oldest 18 holes, this one the oldest nine, this one has the longest-surviving clubhouse, while this club has moved location three times but was indeed originally founded before all the others, etc. Gearhart definitely warrants its place in the conversation, and is believed to be the oldest continual course west of the Mississippi. The course’s timeline is a little confusing, however, and there is speculation over how and when it actually begins. By far the most romantic, and possibly quite valid, version holds that a group of Scottish ex-pats began knocking projectiles - presumably gutta percha balls - around the sandy ground and into tin cans they dug into the turf, in about 1888. This was the same year John Reid and his Apple Tree Gang formed the United States’s first bonafide golf club – the Saint Andrew’s GC in Yonkers, NY, one of the five clubs that together founded the United States Golf Association in December 1894. Gearhart’s crest states the course was established in 1892, but that contradicts an October 1922 edition of the Oregon Daily Journal which stated that ‘Oregon’s first seashore golf links was installed at Gearhart in 1911’. The discrepancy no doubt lies in what was originally an informal and perhaps rather casual affair and what became more official, organized golf. We can be certain that nine holes existed in 1914 as the March 15th edition of the Journal reported that an 18-hole course was nearing completion, and that during the summer of 1914 18 temporary holes would be made available to golfers spending the summer at Gearhart so they would not have to ‘content themselves by playing on the old nine-hole course’. It’s not clear how long the nine-hole course had existed, however. The man given the task of designing Gearhart’s first permanent 18 was George Turnbull, the professional at Waverley Country Club in Portland, one of whose founding members was Robert Livingstone, the Scottish migrant thought responsible for having brought the game to Gearhart. Turnbull would later design Portland Golf Club, and become the first ever professional at Fircrest GC in Tacoma. He also played in three US Opens with a high finish of 19th in 1916 at Minikahda GC in Minneapolis where, but for an opening 83, he would have been a serious contender. Turnbull’s layout at Gearhart measured 6,100 yards and, according to the Oregon Daily Journal, resembled the courses of England and Scotland. 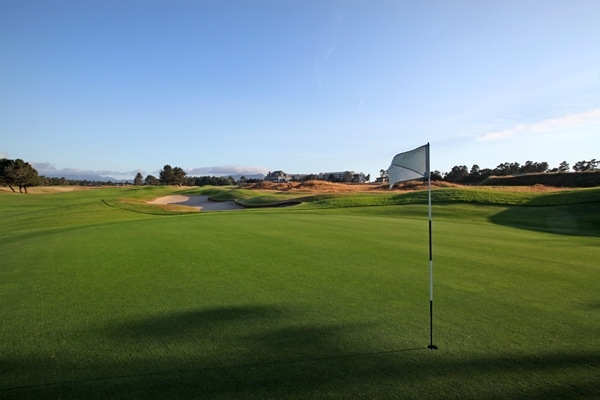 “When completed,” the paper continued, “this course will be one of the finest, if not the finest, on the Pacific Coast.” The Journal also insisted it would rival Del Monte, the first course opened on California’s Monterey Peninsula (1896) and a proud member of the ‘oldest golf course west of the Mississippi’ brigade. Photos from the early 20th century bare out the Journal’s comparison between Gearhart and a British seaside course - the ground was largely barren and untouched by man, the features a little crude. “It is full of natural hazards and the turf is springy,” the paper added. The details are unclear, but it seems the course not surprisingly suffered during the Great Depression. Newspaper reports mention worsening conditions, one writer saying Waverley’s fairways were better than Gearhart’s greens, that the 150 sheep and goats roaming the fairways were creating problems, and that the 70c green fee was exorbitant. At some point, Portland department store company Meier & Frank came in to prevent the course from sliding into bankruptcy, and it moved swiftly to help Gearhart reclaim its lofty reputation as the best course on the West coast. No one can be certain therefore what exactly Egan did at Gearhart, though it’s likely he lengthened the course to accommodate ever-improving golf equipment (steel shafts), and sought to improve the general level of maintenance. Regardless of who designed or redesigned the course, however, Gearhart managed to survive first the Depression and then the second world war intact. But it was about to take on a whole new look. During the 1950s and ‘60s, Gearhart planted trees, likely in response to television pictures showing tree-lined courses such as Winged Foot, Oak Hill, Baltusrol, and Augusta National. Viewers thought tree-lined fairways looked beautiful, and wanted the same for their course no matter how alien it seemed. The story of Oakmont’s conversion from exposed, treeless landscape to heavily-treed parkland was probably a significant factor. Gearhart superintendent Forrest Goodling suspects it was the members of the club attached to this public course that wanted the trees, though it’s hard to identify the culprits. Whatever prompted the move and whoever was responsible for it though, the course’s appearance changed dramatically as dozens of hardy Shore Pines, a common sight on the coast between southern Alaska and Northern California, and a subspecies of the Lodgepole Pine, began appearing on both sides of Gearhart’s fairways. And thanks to seed-eating birds, the trees propagated easily, further changing the look and style of the course. For the most part, the last two decades of the 20th Century were characterized by financial distress at Gearhart, the course changing hands five times in one eight-year period alone, and the Gearhart Hotel and Sand Trap clubhouse both burning to the ground at different times. In 1999, Oregon architect Bill Robinson completed a fairly extensive renovation of the course, and though it certainly improved, the course’s fundamental flaw still remained. Boyle (and team) to the Rescue! It took Tim Boyle’s foresight, daring, and willingness to adapt to precipitate the changes Gearhart so desperately needed. Initially however, Boyle couldn’t quite get his head around the major modifications being proposed. Having bought out his partners in 2010, Boyle took advice from Mike Keiser, owner, developer, and the brains behind the incredibly successful Bandon Dunes Golf Resort. Keiser and Boyle had become good friends during Boyle’s frequent trips to Bandon, and Keiser was only too willing to advise him, saying what Gearhart could become given a certain level of investment, and the right people doing the work. David McLay Kidd, architect of the first course at Bandon Dunes, Jim Urbina who was once part of Tom Doak’s Renaissance Golf design company that created Pacific Dunes, Old Macdonald and the Punchbowl putting course at Bandon Dunes, and Oregon-based designer John Strawn also gave Boyle their two cents (though advice from such learned, knowledgeable and experienced designers was worth a great deal more than two cents obviously). Urbina first visited while working on Pacific Dunes around the year 2000, to get a better understanding of the Oregon coast's climate and vegetation. 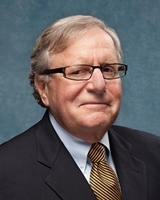 He returned at Keiser and Boyle's request in 2013 to advise on the proposed renovations. "My recommendations centered on mowing lines, greens expansions, and the removal of cart paths and trees to improve sight lines and playability around the greens," he says. He goes on. “It would allow the wind to have an effect which is, of course, crucial to links golf, and because the turf would receive more sunlight, it would become much healthier providing altogether better playing surfaces.” The ‘springy’ turf the Oregon Daily Journal had spoken of 100 years before would return. Gearhart’s General Manager Jason Bangild, who Boyle had bought to Oregon from Charles Schwab’s Nanea GC in Hawaii (one of the courses at which Boyle was a member), carried out the work alongside Forrest Goodling whose career had begun at Broadmoor Golf Course in Portland in 1974 and taken him to Seattle GC, Salishan Golf Resort, Corvallis CC, Charbonneau GC south of Portland, and Portland GC where he was for 17 years before coming to Gearhart in 2011. “We began taking out a few trees in November 2013,” says Goodling. 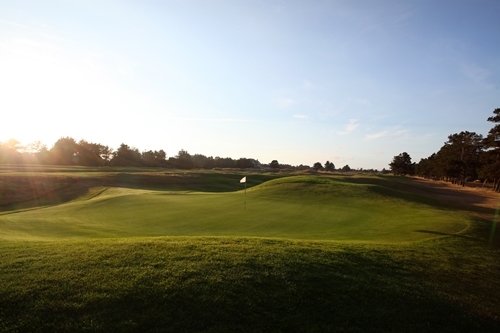 “As the job progressed, however, we really began to see the value of opening up the views and restoring the links turf, so we ended up taking them all out – about 400 trees in all. We contracted an excavation company as we wanted the stumps and roots gone.” The unsightly cart paths went the same way as the trees - removed and, hopefully, forgotten. Gearhart is now an absolutely delightful round. Tim Boyle is justly proud of the course’s makeover saying the renovation was a ‘tremendous success’. “And not only do I think it’s made the course much better, visitors are raving about the improvements,” he adds. 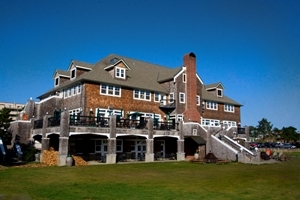 The Sand Trap bar, Gearhart Hotel, and pro shop are all found inside the impressive Kelly House. It’s not just the course that has undergone a profound transformation. For the changes to have the greatest affect possible, Gearhart’s lovely 18 holes needed an equally attractive 19th. The clubhouse and its famous Sand Trap bar were destroyed by fire in 1998, but an imposing Cape Cod-style brick building replaced it in 2000. The fourth incarnation of the Gearhart Hotel, Kelly House was an ambitious venture that sadly wasn’t working under the previous owners. Tim Boyle said it felt like a cold and unwelcoming sort of a place, so he invited an old High School friend to come in and revamp it. Mike McMenamin owns a company with his brother Brian that operates 65 brewpubs, 25 breweries, 11 hotels, nine old-fashioned theaters, two distilleries, a winery which also produces hard cider, numerous music venues, and a coffee-roasting business. With timber paneling and dozens of great old photographs on the walls illustrating Gearhart’s eventful history, the re-opened McMenamins Sand Trap bar is again a fantastic place for a post-round beer and sandwich. In May 2012, 18 guest rooms were opened on the third and fourth floors, making Gearhart Golf Links a wonderful place for an overnight golf trip. Gearhart Golf Links’s past may be a little vague, but its future should be well-defined. Tim Boyle, Jason Bangild, Forrest Goodling, and John Strawn combined to restore a badly-bruised classic to its elegant and entertaining best. 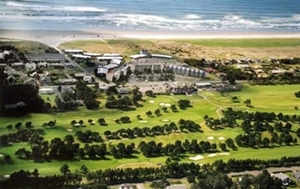 And with the Sand Trap bar and Gearhart Hotel on site, Gearhart’s popularity is sure to skyrocket in the coming years. As if Bandon Dunes wasn't enough, it now seems you have another great reason to head to the Oregon coast. $65 midweek in October and November; $75 on the weekends. $45 For Dec, Jan, Feb.
Green fees this summer were $75 midweek and $85 at weekends. $15 per person to ride a cart. Rooms at the Gearhart Hotel start at $125/night. Stay and Play Packages start at $135/night - also available at the Gearhart Ocean Inn and Gearhart by the Sea.